Revenue in the quarter was $1.9 billion, up 20% from a year ago, and slightly topping analyst estimates. These improvements were challenged by “higher purchased transportation costs, lower intermodal network utilization, lower productivity in winter weather-affected regions, higher driver and nondriver salaries, wages and benefits” and other expenses. Hunt reports results for four major divisions: intermodal, dedicated contract services, integrated capacity solutions and truck. Intermodal’s dray fleet totaled 5,450 power units at the end of the quarter. The dedicated group reported first-quarter revenue of $494.5 million, up 26%, and operating income of $41 million, a drop of 9%. Revenue rose in part due to productivity improvements of 5% revenue per truck, in addition to a $35 million rise in revenue for the group’s final mile services unit. Profits for the division were impacted by “winter weather inefficiencies, higher insurance and claims costs, increased driver wages and recruiting costs, higher nondriver salaries wages and benefits, higher facilities rents” and other costs. The unit recorded a net additional 1,329 revenue-producing trucks by the end of the quarter. The integrated capacity division saw revenue rise 41% to $296.1 million and operating income skyrocket 99% to $9 million. The unit saw volumes increase and revenue-per-load jump 34% from first-quarter 2017, sending operating income higher. Spot volumes rose 43%. The division reported its “gross profit margin increased to 14.4% in the current quarter from 14.3% last year primarily due to increased spot market activity.” Total branch count grew to 44 locations compared to 41 a year ago. The truck division saw revenue drop 1% to $92.7 million and operating income rise 4% to $5 million. 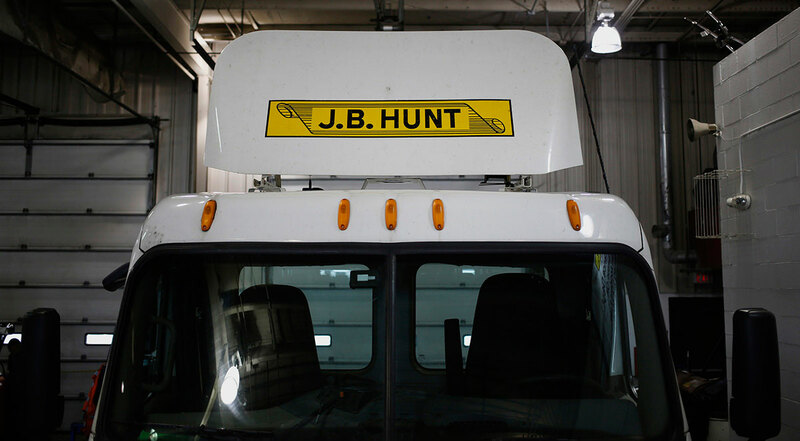 Hunt attributed the revenue decline to a decrease in load count offset in part by better revenue per load. Meanwhile, operating income was impacted by a drop in tractors to 1,926 from 2,144 a year ago along with cost increases. The company’s effective income tax rate decreased to 26% in the first quarter compared with 28% in the first quarter of 2017 due to the U.S. tax reform act enacted in December.